Finally my first costume parts arrived so it is time for me to start my WIP. I have a pair of black Chelsea-style boots that I will fit with a pleather anklet-style cuffs. I bought a large desert colored British PLCE belt with a quick release buckle. Unfortunately, it is too short. 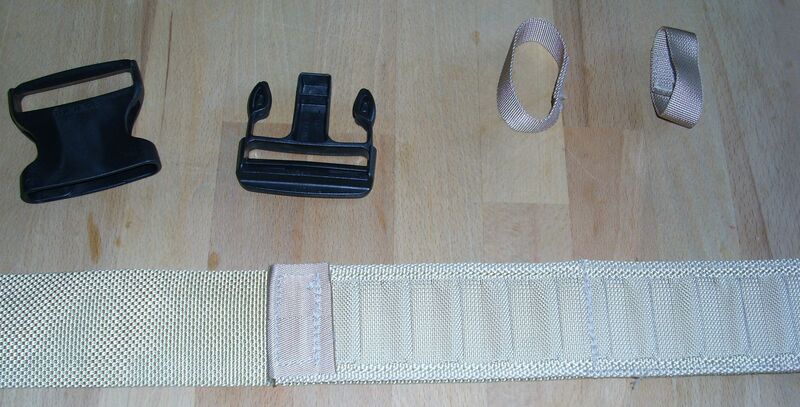 The whole belt is only 129cm and the PLCE webbing part is only 109cm. I took the belt apart and now I am thinking of ways to extend the length without making it too obvious. I ordered some extra webbing that should arrive in a couple of days. I already had an extra roll pin buckle. I put it in vinegar and salt bath to take of the golden finish. It is silver now. The strangest thing happened to me yesterday. I did not want to sew the cargo pants myself this time so I ordered a pair of brown Tru-Spec BDU pants in size 5XL from the USA via EBay. I have a 130cm waist (51.25 inches) and a 145cm (57 inches) hip due to the measurements of the sizing chart it should have been a tight fit. Oh Boy, I was into a surprise when I picked them up from the German customs. They were at least one, perhaps two sizes, too large. I have not had a pair of baggy pants in years. For the first time in my life I am actually hopping that something shrinks in the washing machine. I am still looking for a good shirt pattern. I am a plus sized girl (women’s 30W or men’s size 52) so that is not very easy. Do you have any suggestions for me? I finished extending my belt today. I have not done the loops for the flares yet. I do not have flares so I do not know how wide the loops need to be. I finished the pants and made some adjustments on the belt. Here are some test photos. The flash of the camera makes the shirt look white but it is blue. The boots are missing the anklets and the belt still does not have the loops or flares. I hope to make a test shirt next week. What could I use as flares instead of silver air line hose connectors made out of metal? I really do not want that extra weight of 10 air line hose connectors on my belt. I was thinking of something made out of plastic perhaps in the shape of OT belt flares. Looking good! I am working on this costume as well, to do Tenzigo Weems. Once you make a tan shirt in the RFT pattern you'll be most of the way there. As far as the shirt patterns go, I like to make mine out of two different shirts. 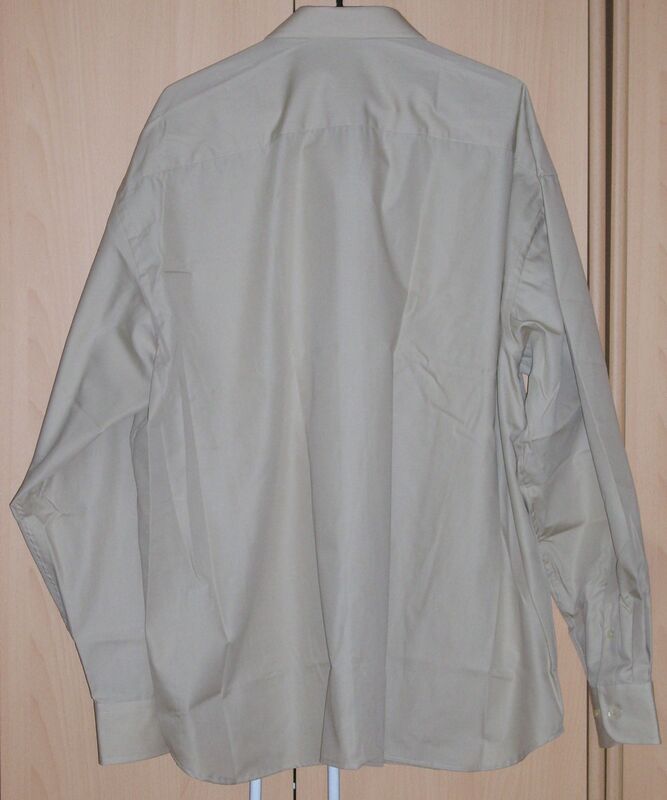 The back of one shirt is usually the right size to fold in half and be the bib. I'd imagine you can do exactly what you did for your RFT shirt (but in tan) and you'll be set. For the belt mini-flares, if you don't want something out of metal there's always the option of 3d printing. Usually 3d printers have some rudimentary drafting skills and could put the ribs on a simple cylinder and print out a set for you. I'm not aware of any existing 3d files, but a search through the TFA pilots section may be in order. This is a task that I need to do myself for my own costume. Yes, my RFT shirt was made in a similar fashion. Unfortunately, I will not be able to make the technician shirt in the same way. I am having difficulties finding a shirt in the right size and color that fits my budget. Due to that I will have to make the shirt from scratch. I have found a pattern that I should be able to adjust. Now I just have to find the time to make the first mock-up. While doing some research online, I found a place in my area that sells plastic air hose connecters. I am going there tomorrow to check them out. I am having some difficulties with making my anklets. My ankles are very thin compared to my calves. Due to that, using a 4 inch straight strap of leather or pleather will not work. I am trying to figure out what curve the strap will need to fit a 13.5 inch (34cm) and a 19.5 inch (48cm) lower calf. There must be a way to calculate the curve but I have not found a mathematical formula for it yet. Thank you very much. That was exactly what I was looking for. I have been calculating most of the morning. Not really the way I wanted to spend my holiday but it is raining outside. I came up with a solution by using some basic geometry formulas and some drawing but I was not sure if I had done it correctly or not. My Radius R1 and R2 were almost correct. I only had an error of 2mm but my Arc Angle was about 28 degrees too small. I was never good at calculating angles. I guess I am also not good at drawing and measuring them. 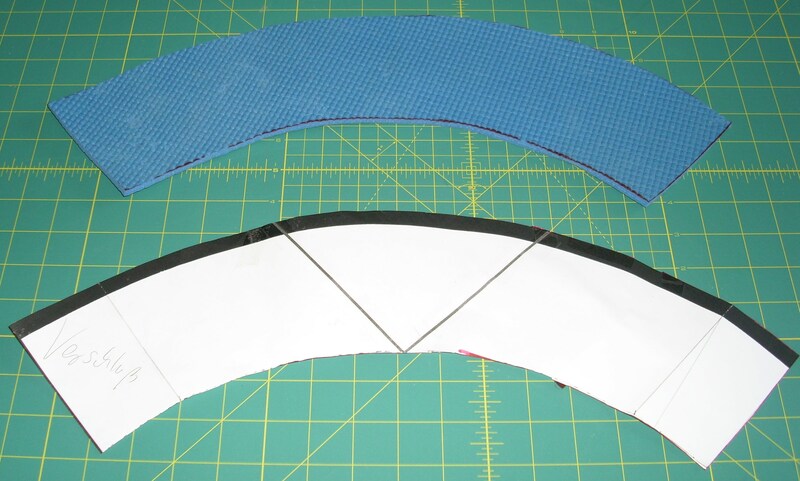 Thanks to Kievan Mereel's help I was able to first make a paper template and then later a foam one for my anklets. I was not able to find a pleather that I like so I ordered some left over leather pieces. This will be my first time working leather in this form. Up to now I only have made holes in pre-made belts. The leather for my anklet cuff came yesterday. It is very soft. I will have to add a foam part to make it stiff enough. 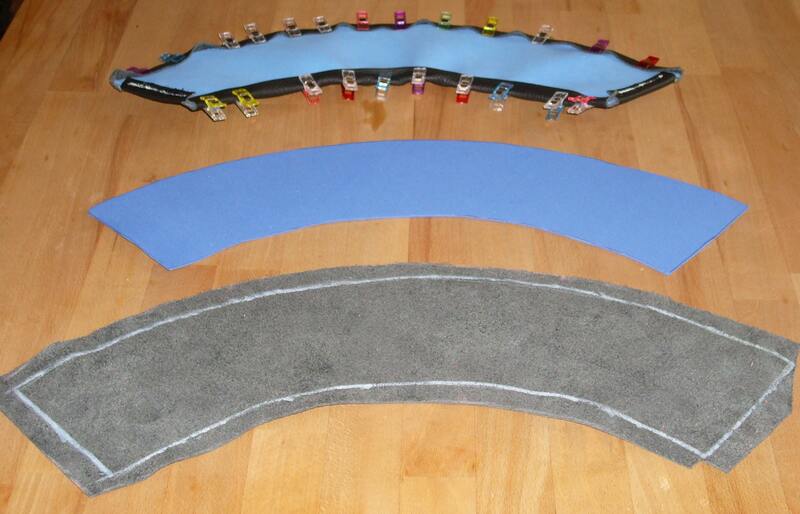 This morning I have been working on my belt flares. 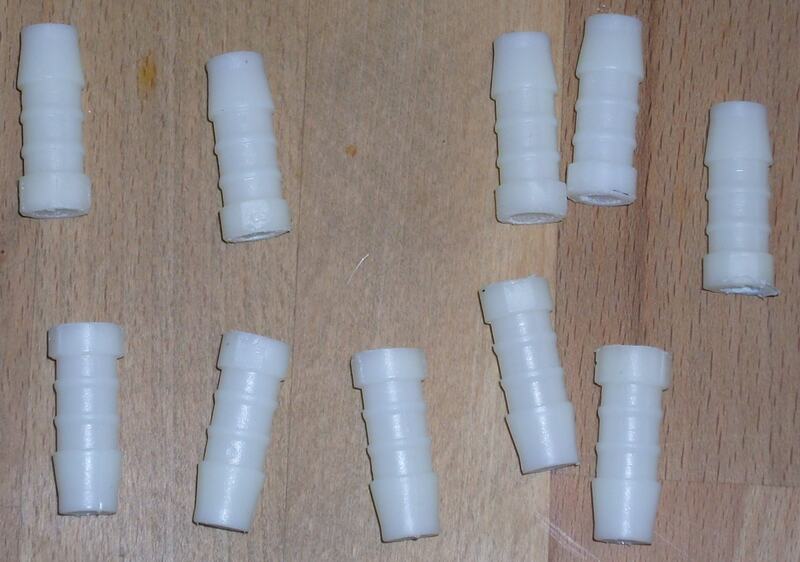 I bought some 10mm (3/8 inch) and 6mm plastic hose connecters. I actually wanted so hose reducers but I can work with what I got. My husband cut the 10mm connecters in half. I will glue the half on to a 6mm connecter so that they look the way they should. I will fill the holes, glue and paint them later this week. 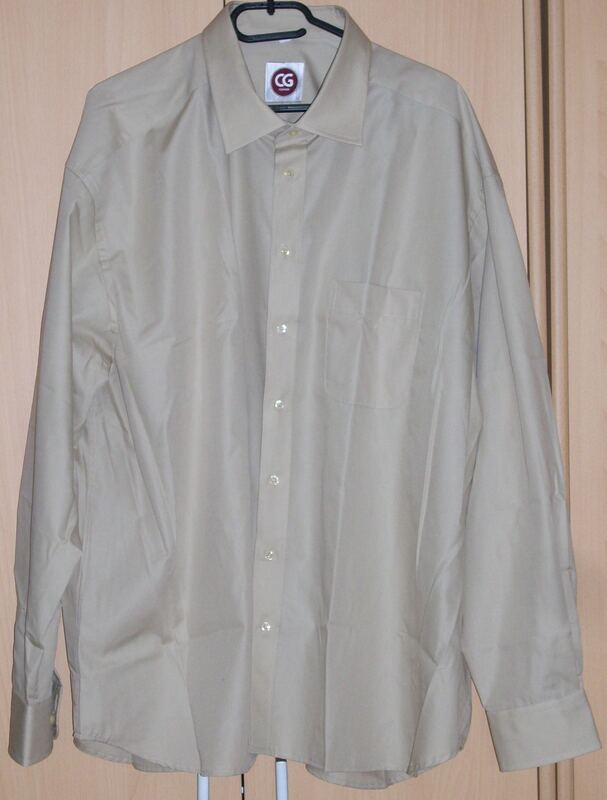 I finally found some button-up work shirts in the right color and size that I can alter to make my shirt. Here is a photo of one of them. They have the optional yoke and they have the double row of stitching in most places. I will have to remove the cuffs. I will also have to use the back and some of the front of the second shirt to create the bib with the seam 2 to 3 inches above the belt line. If everything works out the way I hope it does I should be able to finish this costume by the end of June. My acquaintances with the 3D printers did not have time to print my greebies yet. They are not sure when they will be able to make them. I want to finish this costume by the end of June. Due to that I wanted make them from a one inch PVC pipe and some end caps. Unfortunately, none of the DIY stores in my area had end caps. I do not want to order them online because the only ones that I could find where from China. It would be very difficult to send them back if they were too small/large or the wrong type. Does anybody have an idea what else I could do? Ask the DIY store to order some for you. 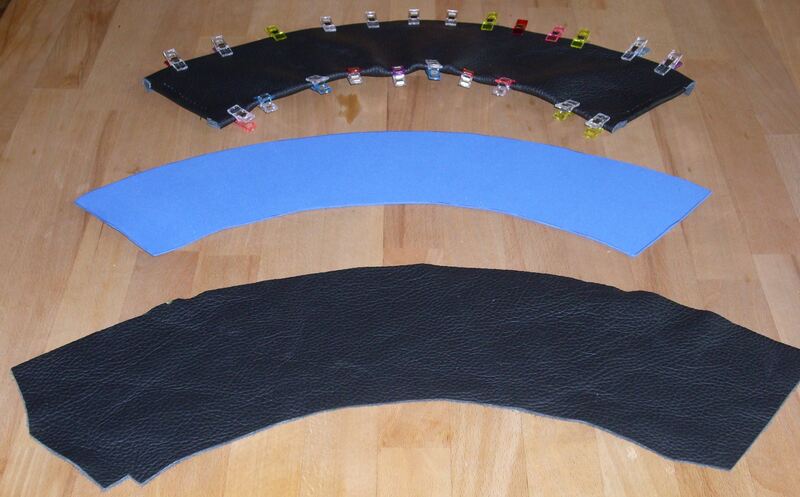 As suggestion for your belt flares: A dowel rod through the center will help keep those glued parts together. See the Klempner/Installateur or Heizungsbauer of your choice and ask them for the parts. Thank you for your suggestions. I will try asking the DIY store to order some end caps for me. The dowel rod will not be necessary. My husband only cut the larger hose connectors in half. The smaller ones are still the way they were. 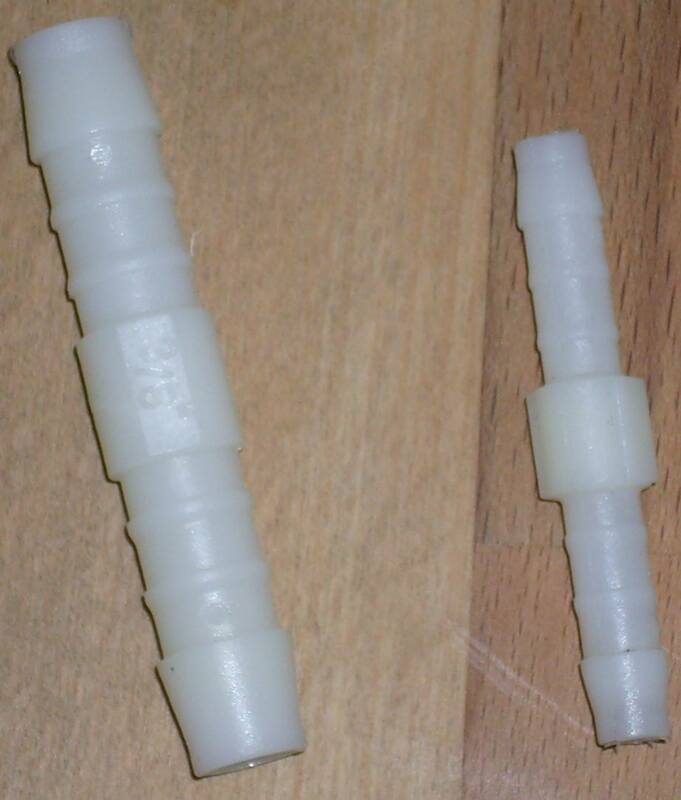 You cannot see it but the top part of the smaller connectors is glued into the larger half. So it is in a way its own dowel rod. I will try the DIY store once more. If they cannot order the end caps for me, I will check with a local Klempner/Installateur or Heizungsbauer.